And that’s why we can’t eat enough fresh spinach around here. I feed my chickens lots of surplus greens from the garden, like lettuce, carrot and beet tops, and herbs, but I limit the amount of spinach I give them to just a couple of leaves every few days. Why? My chickens love spinach, but it interferes with their calcium absorption, which can impact their egg production. Learn more about the dangers of spinach to chickens. Fortunately, it’s easy to preserve the surplus spinach harvest to use out-of-season. Spinach, like other sturdy cooking greens such as chard, collards, and mustard greens, can be preserved with an easy blanching and freezing process. 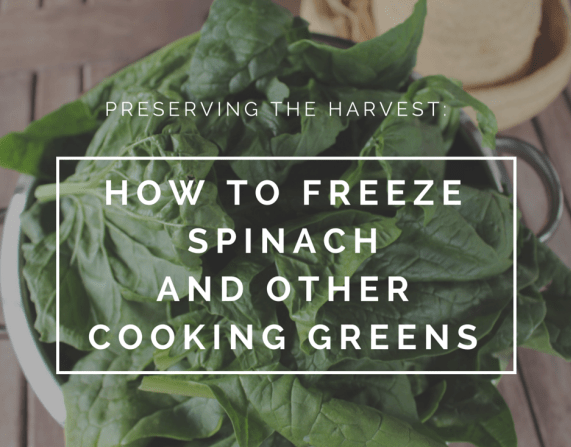 I will show you how to freeze spinach and other cooking greens like chard, kale, and collards with easy step-by-step directions and some recommendations for tools that will make the task even easier. Harvest two pounds of fresh spinach from the kitchen garden. Alternatively, look for fresh, locally grown spinach at the farmers market or source it through a local food cooperative or CSA. Choose fresh greens that are at their peak in terms of flavor and texture. Two pounds of spinach may seem like a lot, but keep in mind that the spinach will reduce in volume substantially during the blanching process. With two pounds of fresh spinach, you can expect to get about two eight-ounce bags of frozen spinach. Tip: Large, mature leaves are best for freezing; save your tender baby greens for a fresh salad. Wash the spinach thoroughly with cold water. 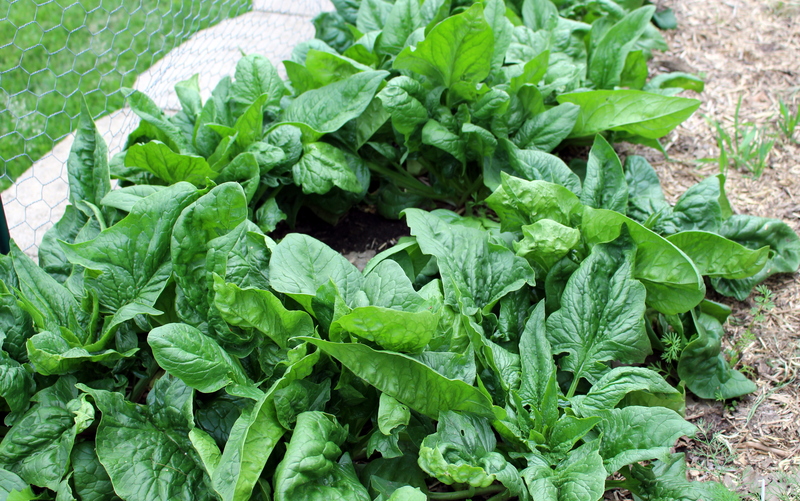 Spinach – especially mature spinach – tends to collect a lot of dirt and grit in its crinkly leaves. 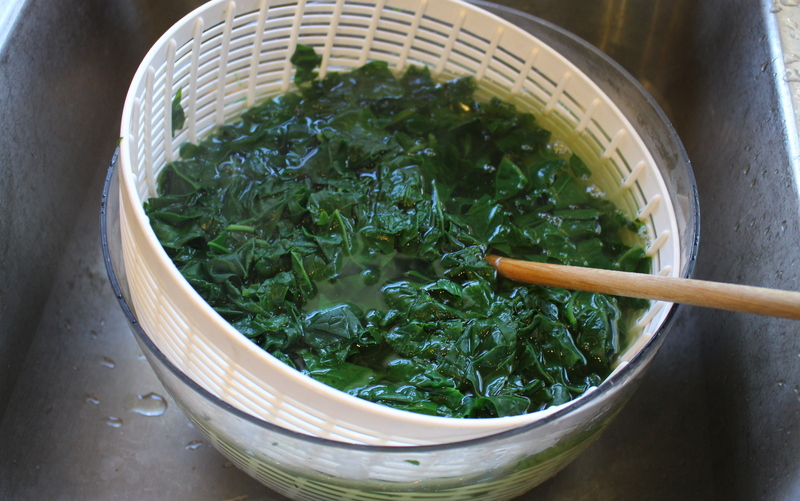 There is no need to dry the spinach before processing; simply allow it to drain in a colander. Bring 2 gallons of water to a boil in the large stock pot. A good rule of thumb is to use one gallon of water for each pound of greens. Do not salt the water. When the water in the pot nears the boiling point, prepare an ice water bath so it is ready when you need it. 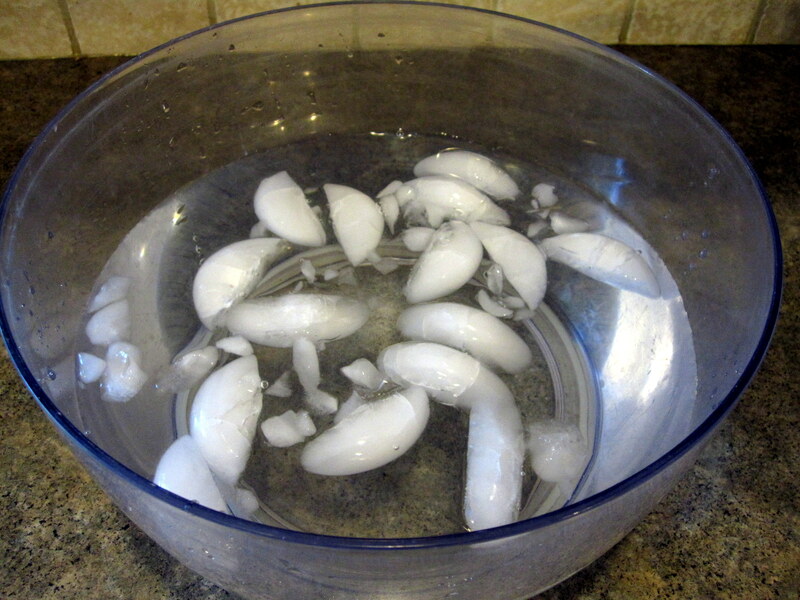 Prepare the ice water bath by filling a large bowl with cold water and ice cubes. The bowl needs to be big enough to fit the colander that you will use to drain the spinach after blanching. I have found that the base bowl of a salad spinner works great for this purpose, along with the colander insert of the salad spinner to drain the spinach. When the water in the pot has come to a rolling boil, it is time to blanch the greens. To “blanch” is to scald the greens in boiling water. Blanching is an important step in the freezing process because it slows spoiling and helps to preserve the greens’ color and flavor. 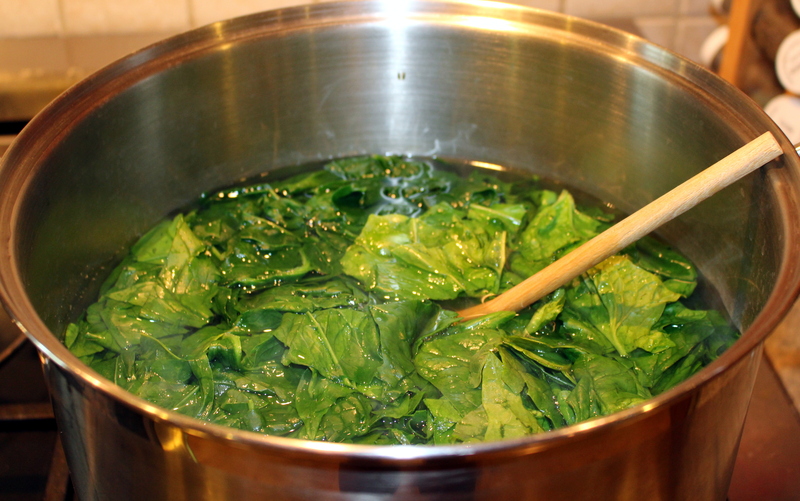 Add all two pounds of the spinach or other greens to the boiling water at once, and use a spoon with a long handle to push them into the water. Blanch the greens for 60 seconds. Begin timing Immediately; don’t wait for the water to return to a boil. At the end of the blanching time, drain the greens into the colander and immediately plunge the colander into the ice-water bath. 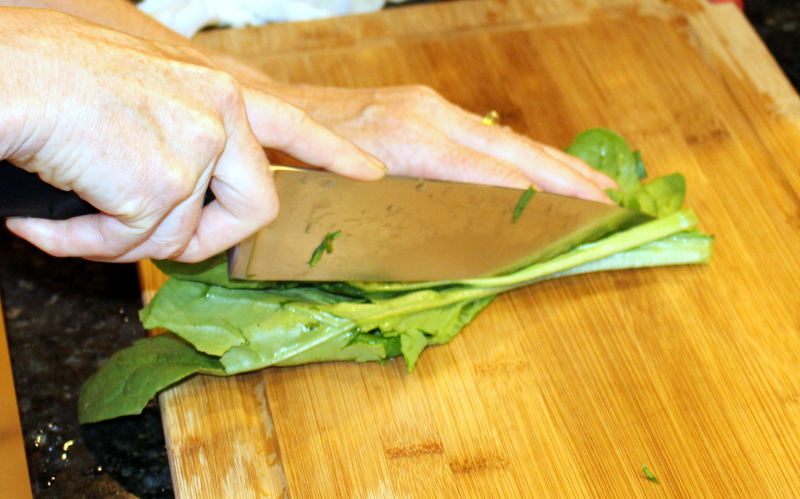 Stir the greens to circulate the ice water and stop the cooking process as quickly as possible. Leave the greens in the ice-water bath for no more than 60 seconds. Remove the colander, greens and all, from the water bath and let drain. 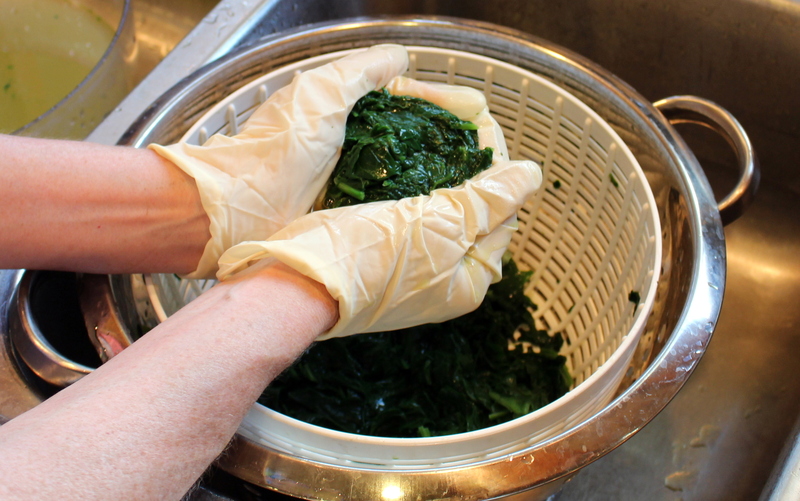 Using your hands (clean hands, of course), squeeze the excess water from the spinach. Try to remove as much moisture as you can. I like to use rubber kitchen gloves for this step of the process. Form the spinach into two balls, and flatten the balls into the shape of a hamburger patty. Place the spinach on a cookie sheet lined with parchment paper. Place the sheet in a freezer for 30 minutes to chill the greens before packaging to help them retain their shape during the packaging process. If you will be using a vacuum sealer machine to package the greens, leave them in the freezer for 2 to 4 hours to freeze any moisture remaining in the spinach so it won’t interfere with the vacuum sealing process. 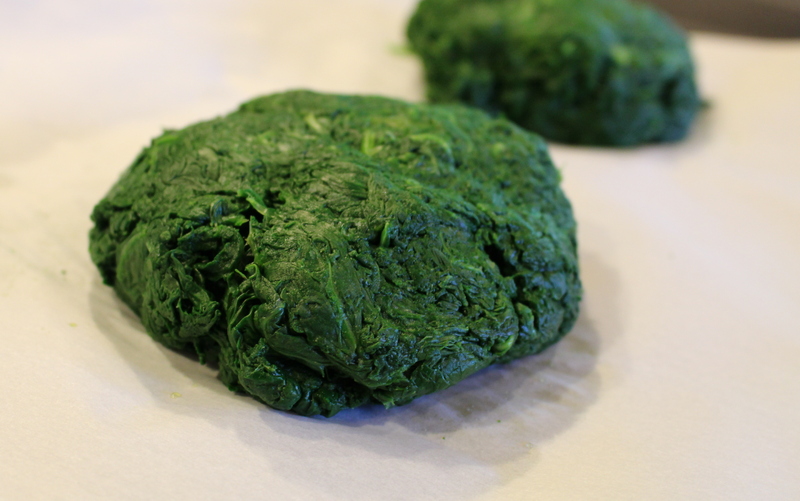 Pack each spinach patty in a one quart freezer bag. Gently push out any air from the bag before sealing. For best results, use a vacuum sealer machine according to the manufacturer’s directions. Use a permanent marker to label each package with the contents and the date. Store in a deep freeze at 0° F or colder, and use within one year of freezing. 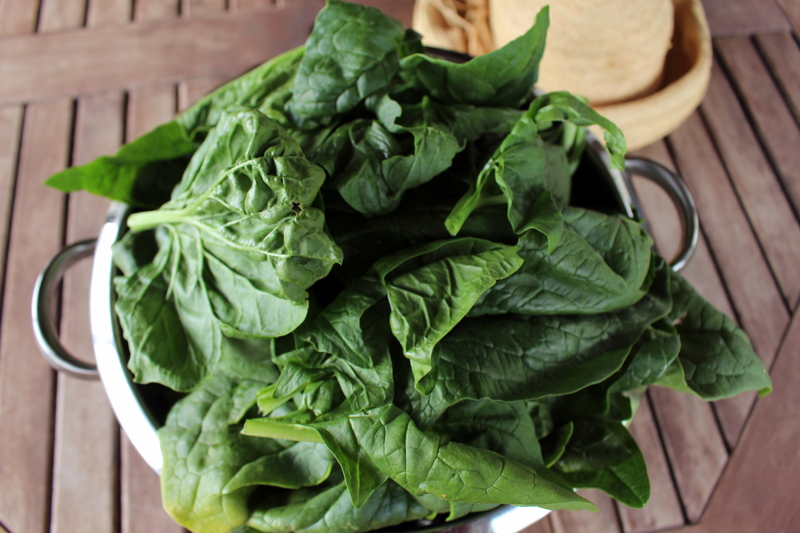 Note: Spinach, like other greens and vegetables, begins to lose its nutrients upon harvest. Freeze fresh greens within a few days of harvesting them to optimize their nutritional value. Some of the greens’ nutritional value will be lost during processing, and nutrients will decline further during storage. 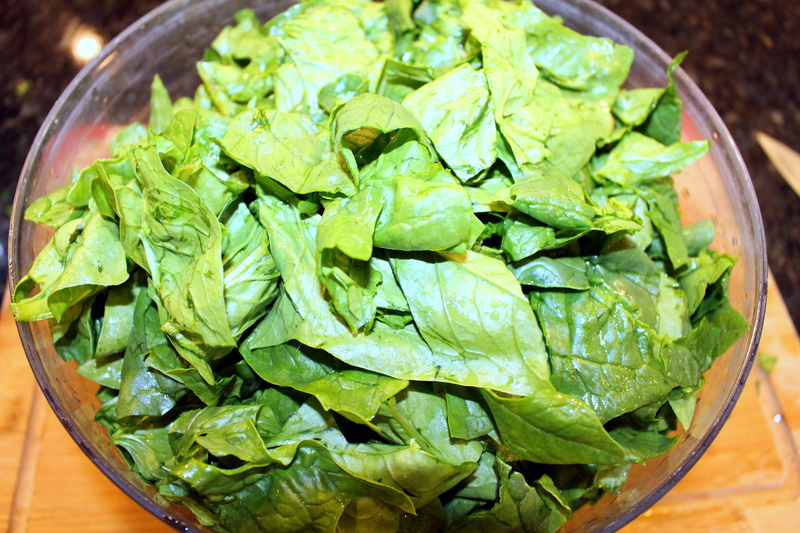 To use your frozen spinach, thaw it in the refrigerator first. Although you removed excess moisture before freezing the spinach, you will want to repeat that process after thawing the spinach. Drain well, and squeeze out any remaining liquid before using in your favorite spinach recipes. Ideas for using your spinach include dips, filling for ravioli, lasagna, and other pasta dishes (combine with ricotta cheese), or in egg dishes like omelettes and frittatas. I also like to add spinach to soups, stews, and smoothies for an extra nutritional boost. For these liquid-based dishes, there is no need to drain the thawed spinach before using. My signature vegetable soup recipe. 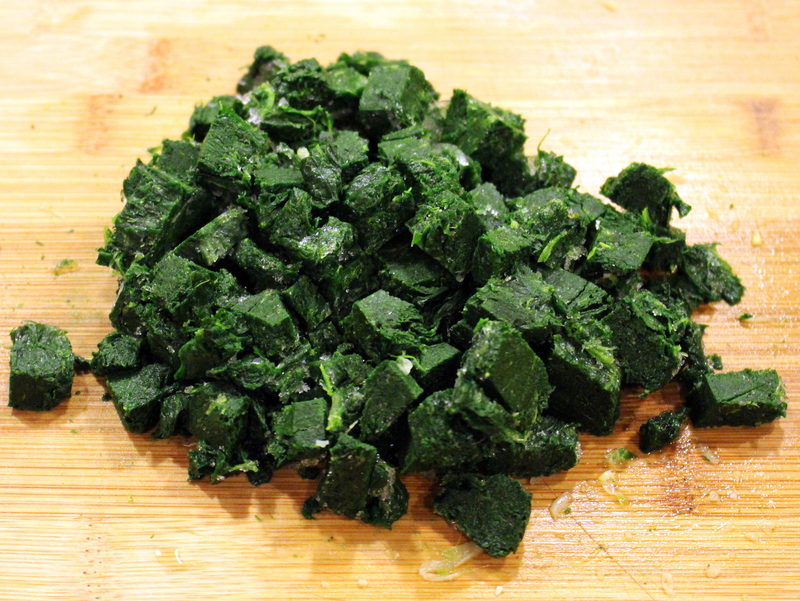 Use to package spinach and many other foods for freezing. 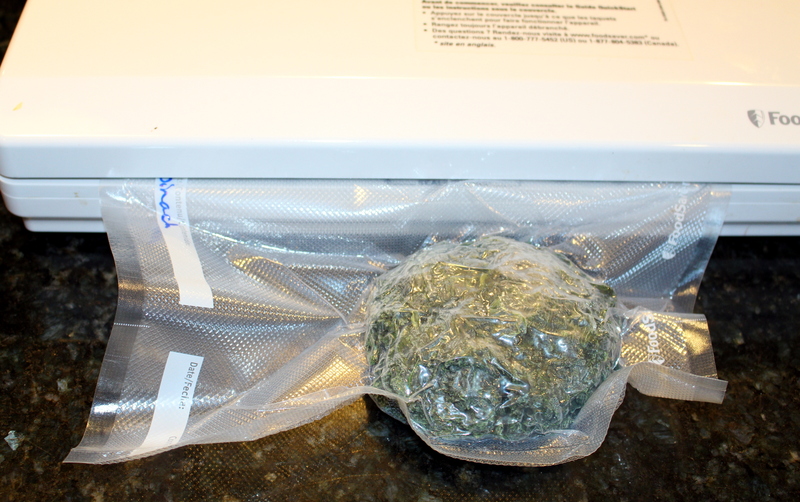 The vacuum sealer removes the air from the freezer bag through a suction process. The absence of air helps preserve the quality and flavor of the food. I personally think anyone who has a vegetable garden needs to invest in a good salad spinner. They are great for washing and drying salad greens and herbs, of course, but I use mine for so much more. As noted above, the base bowl and colander insert work perfectly for draining and quickly cooling vegetables after the blanching process. 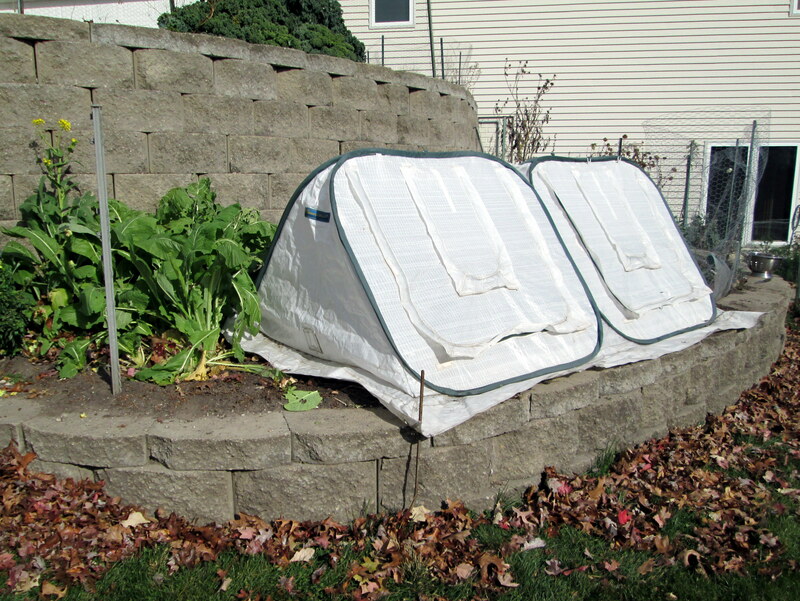 This entry was posted in Preserving the Harvest and tagged food preservation, freezing greens, freezing spinach, preserving spinach by Deborah Neyens. Bookmark the permalink.